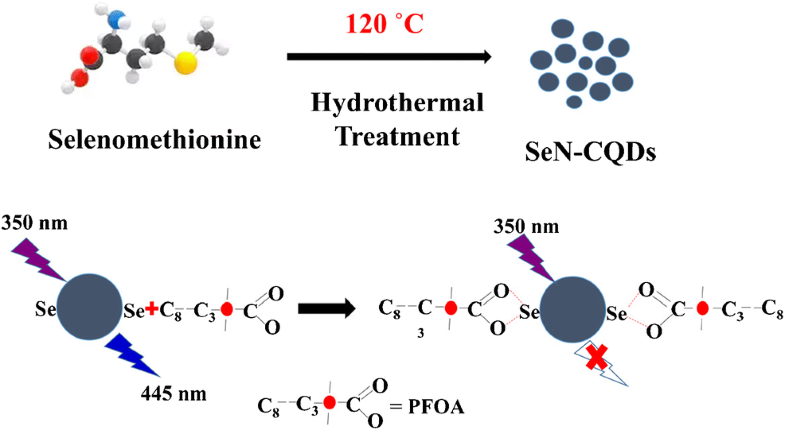 Highly fluorescent carbon quantum dots co-doped with selenium and nitrogen (SeN-CQDs) were fabricated via a one-pot hydrothermal route using selenomethionine as the sole precursor. The SeN-CQDs aggregates have sizes between 30 and 45 nm and display blue fluorescence with a quantum yield of 8% at excitation/emission wavelengths of 350/445 nm. The fluorescence is pH dependent and decreases under acidic conditions. The doping of the CQDs with selenium and nitrogen was proven by X-ray photoelectron spectroscopy (XPS). Fluorescence is selectively quenched by perfluorooctanoic acid (PFOA), and this is accompanied by a decreased fluorescence lifetime. Quenching is not due to aggregation in view of the unaltered sizes of nanoparticles as revealed by TEM and DLS analyses. UV-vis absorption titration suggested the formation of an excited state complex between SeN-CQDs and PFOA, and quenching originates from the internal electron transfer in the excited state complex. The method was used to detect PFOA quantitatively in the linear range of 10–70 μM with a 1.8 μM detection limit. The nanoprobe has a high selectivity for PFOA over potentially interfering molecules. 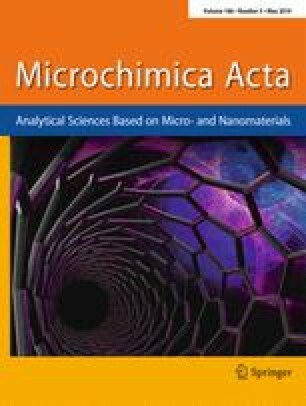 The practicability of the method was ascertained by accurate detection of PFOA in real samples by the standard addition method. The method may be further improved by tuning the interaction between PFOA and SeN-CQDs through optimizing the doping and the surface composition of the SeN-CQDs. Schematic presentation of a fluorometric method for perfluorooctanoic acid detection by using a selenium and nitrogen co-doped carbon quantum dots as the fluorescent probe. The online version of this article ( https://doi.org/10.1007/s00604-019-3400-2) contains supplementary material, which is available to authorized users. Financial supports from the Natural Science Foundation of China (No. 21876108), Special Fund for Agro-Scientific Research in the Public Interest (No. 201503107), and Shanghai Municipal International Cooperation Foundation (No. 18230742900) are gratefully acknowledged. We gratefully acknowledge the support in FTIR and XPSmeasurements by Dr. Weimin Guo of School of Environmental Science and Engineering and Dr. Limin Sun of the Instrumental Analysis Center of Shanghai Jiao Tong University.